Technology is transforming our everyday lives. Your typical work day likely consists of hours sitting in front of a computer checking emails, joining teleconferences, participating in webinars, and more. Your busy schedule is organized and maintained by the calendar and contacts on your mobile device that is the size of a deck of cards. There are mobile apps for everything these days, including one that notifies you when your dry cleaning is ready for pick up at your local Crest Advanced Dry Cleaners. 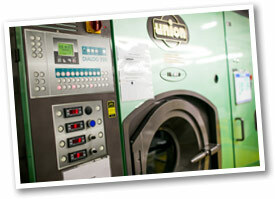 Safe Cleaning Solvents – Do your recently dry cleaned clothes smell? If so, they were likely cleaned in perchlorethylene – a petroleum-based cleaning solvent that has gained attention from OSHA and the EPA for its health risks. Instead, we use a natural, silicone solvent that is odorless and safe for you and your clothes. At Crest Advanced Dry Cleaners, we are committed to the safety of our customers, our workers, and our world. State-of-the-Art Technology – We use the latest dry cleaning technology to extract stains from, clean, and press your garments. Our highly efficient machines and “tagless” tracking allow us to process your order the same day it comes in. Bring your clothes to us by 11:00am, and we will have them pressed and ready for pickup by 5:00pm. Our technology enables our services to be of the utmost convenience for you. Track Your Dry Cleaning – We use “tagless” garment labeling to keep your orders together and track them in the cleaning process. Combine that tracking ability with our mobile app, and you will know when your clothes are ready for pickup – in real time. Recyclable and Reusable – Instead of sending loads of thin plastic garment bags to the landfill every time we send clean clothes home with our customers, we use reusable garment bags that get laundered with each order. Crest’s garment bags also serve as a laundry bag, making it versatile, keeping all of your dry cleaning items in one place – whether they are dirty or clean. Along with reusable garment bags, we also encourage our customers to participate in our hanger recycling program. Ask us for a hanger caddy and start collecting. Community Effort – As part of the EcoTech System, we minimize your number of trips to our stores and the number of single occupant vehicles on the road. Our complimentary Concierge Home Delivery service will pick up your dirty dry cleaning at your door and deliver it the next delivery day. Our commitment to your convenience has a ripple effect – saving you time and hassle while saving the environment from harmful solvents and overfilling landfills – making our world a little safer and cleaner for all.